Kitchen Hood Cleaning Service Provider | Vent Hood Cleaning | Restaurant Hood Cleaning, Lakewood, Renton, Redmond, Kirkland, Auburn, Bremerton, Longview, Puyallup, PowerClean LLC. Only a complete kitchen hood cleaning service - from the hood to the fan on the roof - will reduce the risk of fire and ensure compliance with local fire regulations including NFPA 96 Standards. We clean down to the bare metal. Scheduling Software - Automatically alerts us when your exhaust hood system needs to be inspected or serviced. Once you become a customer, our scheduler will contact you at least one week prior to your maintenance service due date to establish a specific date and time for our hood cleaning technicians to arrive at your location. Further more, we always give a reminder call a few hours prior our arrival. 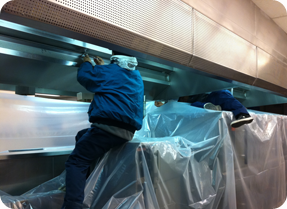 We perform an inspection for your entire exhaust hood system - from the hood to the fan on the roof. 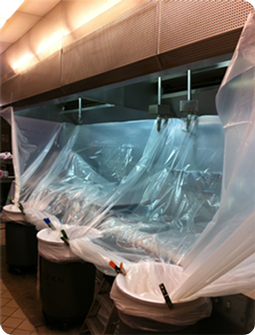 All your kitchen equipment will be covered with plastic to protect it and prevent any contamination of product. 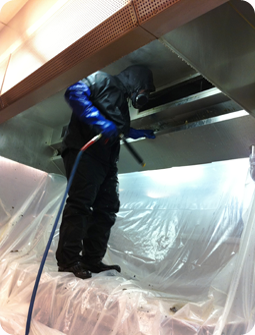 Complete Steam Hood Cleaning - Hot water high pressure washing and scraping of the kitchen hood and vent system: hood, filters, fan, fan grease trap, access panel, fire suppression sensors (fusible links), grease cups, pipes, nozzles and ductwork. Properly cleaned to NFPA 96 Standards. Full Exhaust Fan Maintenance - Unlimited broken or worn fan belt replacement. Get a fan belt adjustment (we check belt tension, wear and alignment) on each hood cleaning service at no extra charge. We also lubricate the fan bearings per service at no additional cost. Detailed polish of all stainless steel exposures - Dry and polish the hood and canopy. Preventive Maintenance Report - After the job is completed, we will provide you with a report of your kitchen exhaust hood system for your peace of mind. No mess clean up - We will leave your kitchen spotless. Certification Labels affixed to each hood system that we service, with date cleaned and date the next service is due. All hood cleaning service technicians are fully Certified, Insured, Bonded, Trained and Experienced. We also provide Fan Hinge Kit installation and Grease Containment Systems. Work will be done in a professional manner, during non-operating hours.